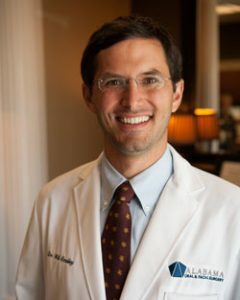 Dr. Will Smalley is from Dublin, Georgia. He graduated with a Biology major from the University of Georgia. He attended the Medical College of Georgia School of Dentistry where he received his DMD degree. He completed his oral and maxillofacial surgery training at the University of Tennessee’s Medical Center in Knoxville. At this level 1 trauma center, his training included: conscious sedation and general anesthesia, head and neck oncology and pathology with ablation and reconstruction, facial trauma with reconstruction, temporomandibular joint surgeries, orthognathic surgeries to correct facial skeletal deformities,and dental alveolar procedures such as extractions, bone grafting, and dental implants. During his residency, he was exposed to facial plastics as well cleft lip and palate reconstruction in pediatric patients. Dr. Smalley is certified in Basic Life Support (BLS), Advanced Cardiac Life Support (ACLS), and Pediatric Advanced Life Support (PALS).